The word ‘chandelier’ means ‘candle holder’, and it comes from ‘chandelle’, a French word, which is interpreted as ‘ceiling light fixture.’ The earliest chandeliers had only two wooden beams shaped like a cross with prickets on each end to place the candle. Today, chandeliers are huge and ornate to make vivacious and charming interiors. Originally, chandeliers were used in churches, castles and wealthy homes and their primary purpose was to illuminate a space in the night. The wood chandeliers of the sixteenth century were replaced by decorative structures made of a variety of materials, such as wrought iron, ceramic, stained glass, crystal and deer antlers. Crystal and glass chandeliers are sought after lighting fixtures because of the shimmering effect produced by refraction via complex arrays of crystal prisms and glass. Wrought-iron lights are almost synonymous with the Mexican heritage, as they have made significant contribution to the country’s traditional art. Mexican rustic décor is invariably related to antique wrought-iron chandeliers and lighting fixtures. Their designs still bear the inspiration from Europe and noble South American homes of earlier days. 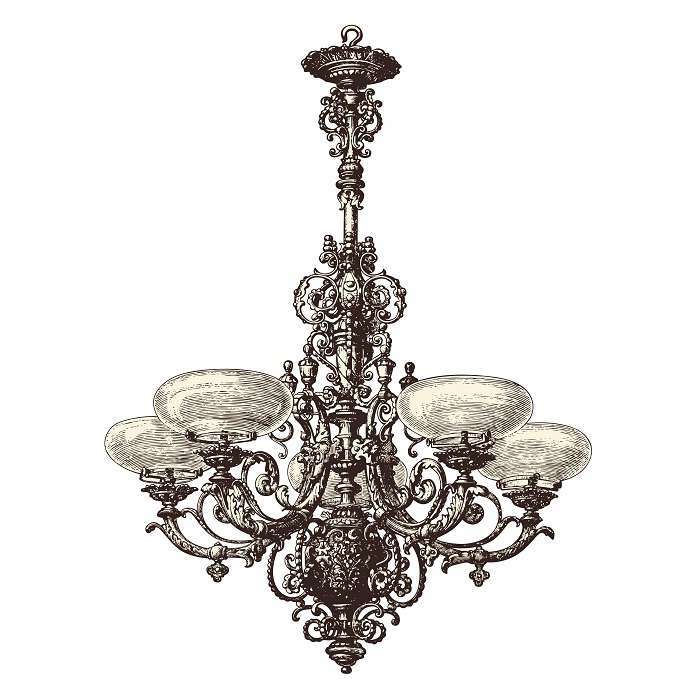 Antique lighting fixtures are the work of skilled hands using hand-forging methods and finishes. The wrought iron metal is hand-punched, forged and assembled in fine designs. Wrought-iron has long been used in Mexico for various accessories, including racks, table lamps, pot stands and candle holders. Tin and pewter are other important metals that were used by traditional metal artisans. Mexican star lanterns are yet another depiction of the remarkable craftsmanship of talented artisans. Mexican star light chandeliers consist of mirrored glass panels that can augment the rustic elegance of any interior. Tin star lights create a festive look, while punched tin spheres form a twinkling galaxy in the place where they are hung. Star lights were actually crafted as lanterns with the intention of placing candles in them. Hanging star lanterns are made from silver and tin with mirrored sides, jewels and other decorative elements. Punched tin accessories, particularly mirrors, complement the beauty of lamps and lanterns alike. These accessories are also a significant part of traditional art and craft of the past centuries, after the Spanish came to Mexico. Today, chandeliers use low wattage bulbs shaped like candle flames and provide fancy illumination to any room. Nevertheless the value of Mexican antique chandeliers, or any antique chandelier, remain high, owing to their rarity and age old craftsmanship.